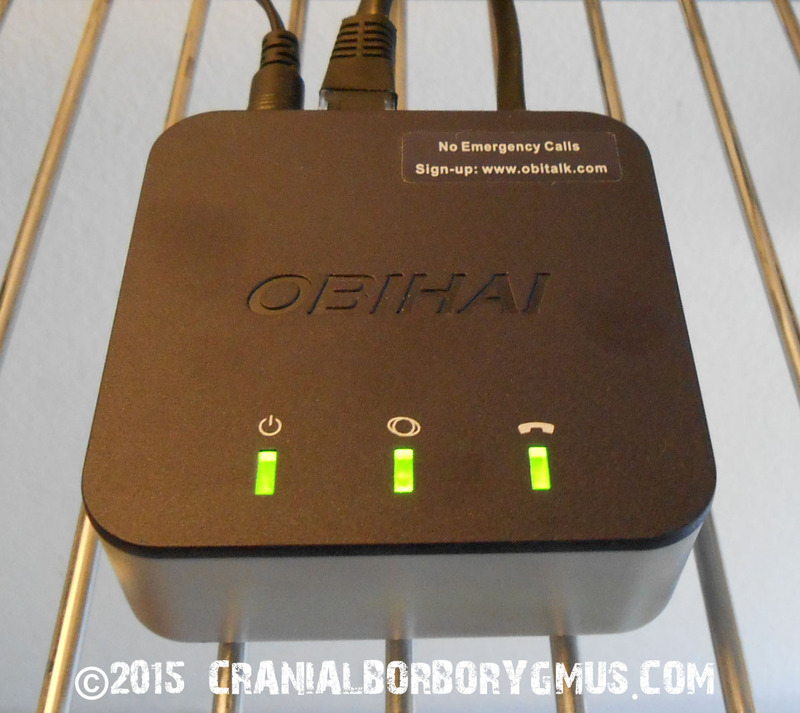 Review Summary: I highly recommend the OBIHAI Obi200 VoIP phone adapter. It works. When you combine the OBi200 with Google Voice, you get a FREE home phone line that works just like a "regular" landline. We've been using the OBi200 and Google Voice for our home phone for about a year (purchased October 7, 2014), and we've never had problems. The OBi200 works and is reliable, and the call quality is crystal clear. We were paying Verizon $31.22 after tax per month for a basic landline phone. Now our phone costs us nothing... nada... zilch. And we have free long distance calling anywhere in the US. And with Google voice, all of the add-on features like voice mail, call forwarding, etc, are free, whereas with Verizon we didn't have them because they would charge an additional monthly fee for every single feature. If you want a free landline phone, consider the OBi200 and Google Voice. My only complaint would be with myself for not doing this sooner! No monthly service free! OBIHAI service is FREE! Setting up the OBi200 VoIP phone adapter and a new Google Voice phone number was simple. Since then, I haven't touched the OBi200, and I've never had a problem with it. It just works. STEP 1) The OBi200 comes with the OBi200 device, a power supply, an ethernet cable, and paper instructions. The first step is to hook up the device. First, you plug your phone into the phone port. Second, you plug an ethernet cable into the ethernet port and either your broadband internet router or modem, Finally you connect the power supply to the power port. The front of device has three simple lights. On the left is the Operational indicate that lights solid green to show the device is powered and operational. In the middle is the Data indicator that is normally green and then flashes when there is data activity, and on the right is Phone indicate that is solid green when your phone is ready and flashes when your phone is in use. STEP 2) Next, you verify the device works by dialing a special OBiTALK test phone number. Once you confirm it works, you can call other people on the OBiTALK network, but most of us want to finish up and be able to use the phone like a regular landline! STEP 3) Next you go to obitalk.com and set up an OBiTALK account. The website has easy to follow on-screen instructions that lead you through the simple process. Once your device is registered and added to obitalk.com, you're ready to connect the device to a Google Voice number or to another VoIP service provider. Again, the website has easy to follow on-screen instructions that lead you through the simple process. GOOGLE VOICE: Google Voice is free. You can get a phone number to use at http://www.google.com/voice . Google Voice has all sorts of nice features, all of which are free. Voice mail is very easy to set up. You can also port your existing phone number over to Google Voice (there is a small charge), but I would first set up a new number to try Google Voice and confirm you like it. Once you know you're happy with it, you can port your old number over and replace your new Google Voice number with your old ported number. 2017 Google Voice update - I now also use a different separate free Google Voice number for my cell phone service. I wrote a guide on how to get a free Google Voice number and also how to use Google Hangouts for your cell phone service. For cell phone service, when you're not on wifi, you'll need some cellular data for Hangouts to work so you can send and receive calls and text. You can get free AT&T cellular data with a FreedomPop LTE sim. Yes, it's really free! Read my FreedomPop LTE sim review. About the only requirement for using the OBi200 is that you need a decent broadband internet connection to insure high-quality calls. The download speed isn't that important, and you don't need to pay for a lot of bandwidth. We have the Cox Cable "Starter" Internet package with 5Mbps download speed and it is more that sufficient. Another nice thing about the OBi200 is that it does not require a computer. It works entirely on its own, and it doesn't matter if your computer is turned on or off. It's like having a landline phone, but it's absolutely free (including long distance). We've been using the device and service for almost a year almost three years as of May 2017! The call quality is crystal clear. All the call we make and receive work. My only gripe is that I didn't do this earlier! The OBIHAI OBi200 VoIP phone adapter combined with Google Voice works. If you're still paying for a landline phone, you should really try out the OBi200. You might be hesitant to try the OBi200 because you aren't sure how long Google Voice will be free, or will even be around. I would say this: Even if Google Voice started charging and/or disappeared, OBi200 also works with several other VoIP services. But I really doubt Google will drop Google Voice. It doesn't cost much at all for them to run it, and it gives them a foot hold into the phone service sector. I also don't think they'll start charging for it any time soon. I think Google is more interested in growing the number of subscribers than collecting a token fee from their existing subscribers. Plus, once a company starts charging for phone service, they have to start calculating and collecting all the federal, state, and local taxes, which is no small matter. Plus when people start paying for something they start expecting a level of customer service that isn't required for a free service and that can get expensive. Just as I predict gmail will remain free, so will Google Voice. I am reminded of the saying, "Great minds think alike." Seriously though, I do think the Obihai is a no-brainer for a free landline if one has high speed internet. Now if only I could come up with a way to get free home high speed internet! As for your question, I have a Google Voice number that rings both my Obi200 and a cell phone that I have hangouts on. My phone plugged into the Obi200 always rings. If I don't answer it, eventually it will go to Google Voice voicemail. If I have any problems, it is that usually my cellphone with Hangouts also rings right away, but sometimes it is delayed or doesn't ring. Have you confirmed that the Google CHAT box on your Google Voice account is checked? Also, I might be confused, but if you have your GV number forward to a cellphone, and then you call from the cellphone it is forwarded to, I would think it would get a busy signal and go to voicemail. That is, it makes sense that maybe you can't call yourself. Do I understand this correctly? I had Google Voice Voip for my house phone but got a notice, a few years back that they were stopping Voip service through GV. I purchased service through Phonepower since. If GV is working again for my home phone, I'd like to know so I can save a few bucks. Hi Fred, I think back in 2014 before I got my Obi200, there was talk of Google Voice ending support for ObiHai, and maybe they even did for a while, but then they worked out a deal, and Google Voice has been supporting Obihai ever since. In any event, it's worked fine ever since I bought my Obi200 in 2014 and set it up with a free Google Voice phone number. So I've had free home phone service ever since (for almost three years now), and I was just talking on my phone this morning. So as of today, everything still works! I'd definitely recommend you get on and try it out. Hi Steve, Really glad to see you start a page for Google Voice services. I've really enjoyed your FreedomPop information page. I've been using GV since it was Grand Central. They were purchased by Google to create Google Voice. I wanted to ditch my AT&T landline ($45 a month) and finally did a couple of years ago using an Obi 200 with a company called PhonePower. They have a deal for Obi users for $34.99 a year. There are some usage limits with PhonePower but I don't use very many minutes of outgoing calls each month. No limit on incoming calls. I wanted to transfer my existing phone numbers directly to GV and eliminate PhonePower, but Google would not let me port in my landline numbers. They said something about you can only transfer in from a mobile number. Do you know if that has changed. Hi Scooter, Great comment and question! I don't know the history of Google Voice, and didn't know it started as Grand Central and was acquired by Google. Thanks for the history lesson! I also don't know anything about PhonePower, but if you are paying them, it makes sense to port your number to Google Voice and get your "landline" service with the Obi200 for free. As far as I know, Google Voice only allows you to port in a traditional "mobile/cellular" phone number, and not any number that it recognizes as a traditional landline number or a VOIP number. There is a way to do it though, but it's a two step process. You need an unlocked GSM cell phone and a T-Mobile pre-paid card. First you set up the T-Mobile pre-paid card which comes with it's own number on your cell phone. Then you port your landline or voip number to the T-Mobile account. It is now a "cellular" number, and you can then port it to Google Voice. If you search on Google, I think there are guides on how to do this. I checked and the T-Mobile prepaid sim card is on sale for $10 (normally $25) with free shipping on T-Mobile.com. So you have the cost of the T-Mobile sim card and then Google Voice charges $20 to port a number in, plus the whole process takes a couple extra days because of the double port. So it isn't super easy, but I think it is possible. Good luck, and let me know how it goes if you do it. Thanks! Hi Steve, I have never owned an Obi but have been reading about peoples experiences with them. The Obi110 was given a "end of life" status in 2016 so Obihai would no longer have to support it and users would have to buy a newer model. I have never heard of a company doing that to its products. Imagine a part breaking (and is no longer available) on your 1-6 year old car and having to buy another car! Maybe if that happens to someone at Obihai they'll rethink their strategy. If not, the Obi200 will probably go through the same "end of life" soon. My question is: Can the Google Voice number associated with the Obi device be rescued from Obihai and used with another VOIP product? One user said he could not get his GV number to work properly after cancelling his Obihai account and disconnecting the Obi110 box. It acted like Obihai was intercepting the incoming number and his phone would not ring and the caller gets a "cannot complete the call" message. Hi Greg, Good questions. Other companies also have "end of life" for their products. I'm thinking of Microsoft Windows (95, XP, 7, etc) and also several HP printers I have that they won't warranty anymore, and parts are no longer made for them. So I think "end of life" just means that the product is pretty old and the company is not going to provide service or continue to make parts or update software. End of life doesn't mean that the product automatically stops working... you can continue to use it as long as you want (though with software it becomes more challenging), it's just that the company is not going to continue to make replacement parts or continue to provide technical support. Anyway, I'm happy with my Obi200 and have more than gotten my $50 bucks from it, and will continue to use it until it doesn't work (sort of like Windows XP). If I have to buy a new device every 8 years or so, I'm still ahead of the game. I've got several old cell phones that are now essentially paperweights. They still work, but not on today's systems (analog vs digital, 2G vs 3G vs 4G). As for a Google Voice number, if you just log into your Google Voice account and uncheck a box, it no longer forwards to the Obi device, as far as I know, so I don't see how Obi can not release a GV number, since they don't control it. Hope this helps! Hi Steve, thanks for the reply. So, timing is everything as far as when to buy their products. I would hate to buy the Obi200 now and have it cut off in less than 2 years. I think I'll wait for their new model to come out seeing that the 200 is somewhat old now (by their measure.) I'll continue using Google Voice without the Obi hardware (just mic and speakers) as I have done for 3 years. Hi Greg, If you already have a free phone line set-up that is working for you, I can understand your hesitation. That said, I think the Obi200 series will continue to work for quite a while, and I also don't think there is any imminent "end of life" on the horizon for it since there is not a Obi300 series yet. As for the Obi100 series, as far as I know, they still work just fine. ObiHai is just saying that if Google Voice makes any changes, they won't make any new software updates for the Obi100 because of the "end of life" for it. For any readers who are currently paying for a landline, I continue to recommend they switch over to get free service with the Obi200 and a Google Voice number, since people will quickly make back their investment in the Obi200 by no longer needing to pay a monthly phone service bill. Is the service still free except for equipment? Hi Vince, Yes, the phone service is still free after you buy the Obi box and get a free Google Voice phone number. I'm still using the Obi200 box with a Google Voice number for our home "land line". The service continues to work just fine, and more importantly, is still completely free. Do you have a comment or question on my review of the OBIHAI OBi200 VoIP phone adapter and Google Voice? Fill in your name and comment below and click [Submit Your Comment]. Comments will not be posted until after I have reviewed them.